Yesterday I noticed that our SSL connection on this blog had errors due to “mixed content”, meaning our HTTPS site was loading additional content that was served over insecure HTTP. After a little bit of digging in the console, I discovered that the issue was due to our Disqus plugin loading over http from pixel.tapad.com (we've seen other reports with lore.circulate.com as well). I found this great blog post describing the issue as well as a fix, but even better, on that blog post a tech lead from Disqus commented with a better fix. Kudos to him for doing that! 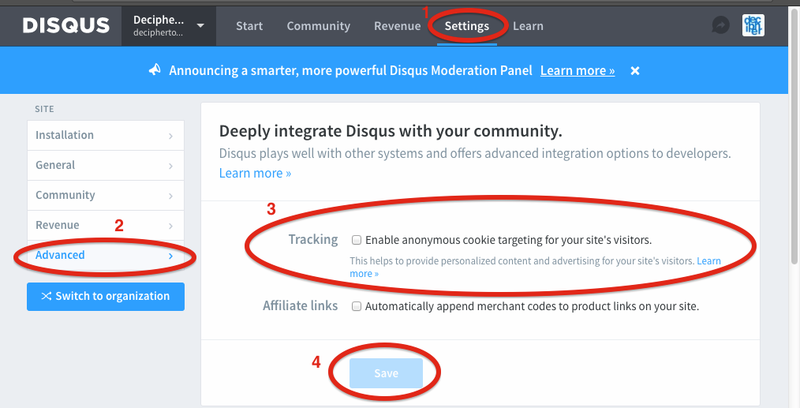 Login to your Disqus administrator account and go into your HTTPS site's settings. Uncheck “Enable anonymous cookie targeting for your site's visitors”. Thanks for this Article . I will appreciate you . Thanks for this post. That was helpful. nice work on finding this connect Kelly!!! This was the top Google result and fixed it, thanks!